Available Colors: Blue, Red or Black Hands with White Handle. Shipping Weight: Bulk, 250 per carton @ 16 lbs. 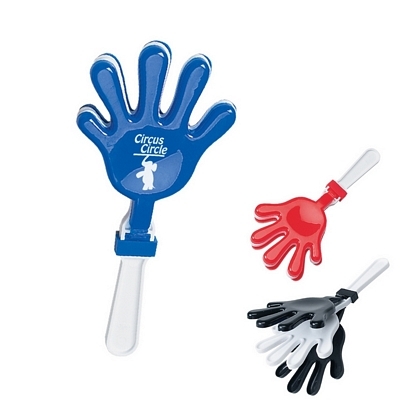 Customized Applause Hand Shape Clapper Item #HT-58 (Minimum Order: 150). Promotional Applause Clappers like the Applause Hand Shape Clapper can be personalized with your business logo and with No Setup Fees. 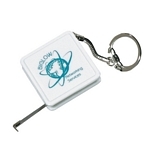 Customized Square Tape Measure Key Tag Item #HT-63 is Promotional with your business logo for advertising to clients. 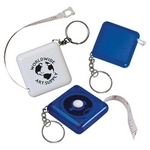 Customized Square Tape Measure Key Tag and other Promotional Key Chains are decorated with No Setup Fees. Customized Tape-a-Matic Key Tag Item #HT-62 (Minimum Order: 250). Promotional Tape Measures like the Tape-a-Matic Key Tag can be personalized with your business logo and with No Setup Fees. Customized Tape Measure Key Tag Item #HT-60 (Minimum Order: 250). 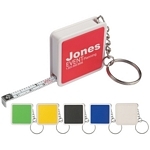 Promotional Key Chains like the Tape Measure Key Tag can be personalized with your business logo and with No Setup Fees. Customized Tape-a-Matic Round Tape Measure Item #HT-61 (Minimum Order: 250). 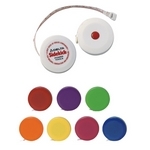 Promotional Tape Measures like the Tape-a-Matic Round Tape Measure can be personalized with your business logo and with No Setup Fees.